Contains 6 Filter cartridges per package. This cartridge features a unique multi-depth poly sediment filter which uses the entire depth of its media to 5 microns. The result is a longer filter life and higher flow rates. The polypropylene media is highly resistant to bacteria making this an excellent choice for municipal water and well water treatment applications. The cartridge is in the standard size the fits both the ¾" and the 1" Sediment Filer Housing. Flow rates range from 6-10 GPM depending on plumbing and incoming water pressure. THOROUGH FILTRATION | Cartridges feature a unique multi-depth poly sediment filter to ensure all sediments are captured leaving your water pure, clean, and smooth. 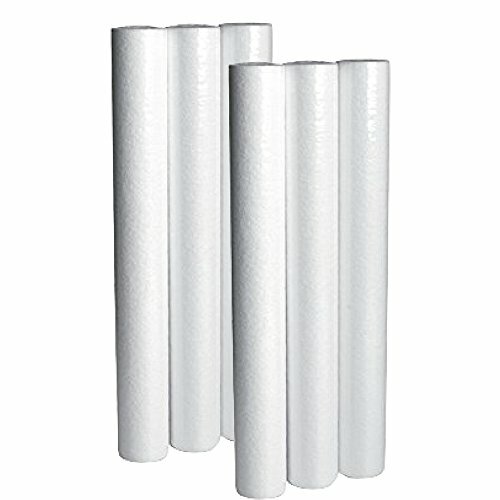 BACTERIA RESISTANT | We use a special material called polypropylene in our filters which are highly resistant to bacteria making this an ideal product for municipal and well water treatment. 5 MICRONS | This filter purifies using the entire depth of it's media to 5 microns giving it a longer filter life and and higher flow rates. Sifts out even the finest dirt, salt, and rust. 6 CARTRIDGES | Comes with 6 cartridges at at size of 20" x 2.5"
BRAND YOU CAN TRUST | Lifesource Water has been manufacturing and distributing water treatment products since 1984. We take great pride in our products and are confident you will see and feel incredible results. If you have any questions about this product by LifeSource Water Systems, contact us by completing and submitting the form below. If you are looking for a specif part number, please include it with your message. BRITA Chrome Faucet Mount Filtration System, Includes 1 System and 2 Filters.